Thanks for visiting John Poulton Transport – a road haulage business and driver training company based in Tipton in the West Midlands. Established by John Poulton himself in 2006, the business has since gone from strength to strength. Initially, as John trained to become an NVQ assessor, the business primarily focused on driver training. He then went on to complete NVQ training for HGV vehicles, and also became an instructor for the prison service which saw him instructing soon-to-be paroled prisoners on vehicle loading and techniques. In 2011, John gained a teaching qualification, allowing him to teach in classrooms and also establish the driver CPC centre. 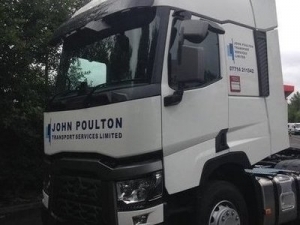 John Poulton Transport now regularly services a wide variety of companies with their expertise in haulage driver training. Having successfully established the driver training side of the business, John went on to develop the road haulage aspect of the company. We are now proud to have a new, top quality fleet of vehicles ready to meet your requirements.